Posted on September 17, 2018 - 12:18am. So I heard you have a friend so cute that you would love to send some love paragraphs to. And I have created enough Long Paragraphs to Send to that Friend of Yours. Yes, Long Paragraphs to Send to Your Best Friend. From beautifully written cute paragraphs for you best friend to wake up to, to the awesome ones to say thanks to your best friend for being a part of your success story, you can't get anything less that the best of best friend paragraphs that are sweet to the last letter. Even if you want some paragraphs to make someone smile and happy or some paragraphs to cheer someone up, you are at the right spot. Enjoy them and feel free to share. Thanks so much. The best of long paragraphs for your best friend male or female. 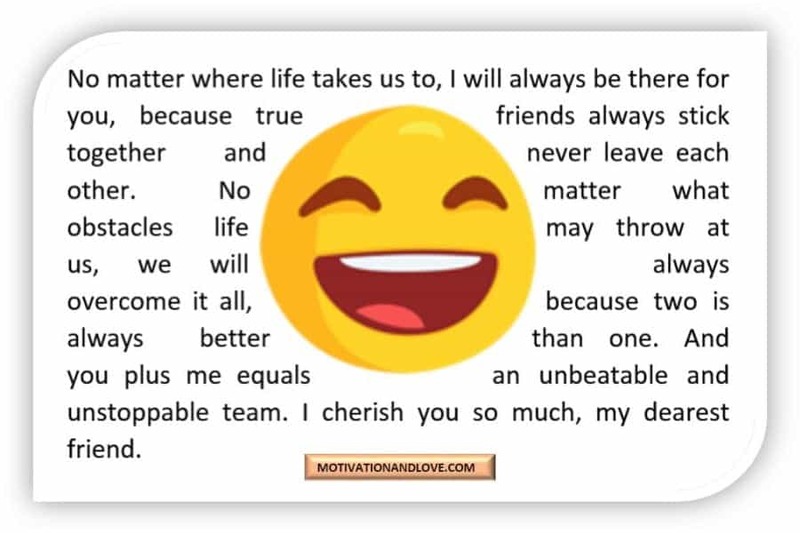 Whether you are planning to praise a friend for their arm of friendship or cheer them up to be better, these long paragraphs are you best bets for that special friend of yours that doubles as your best friend. They are Long best friends paragraphs copy and paste, so be free to copy for your free use. 1. No matter where life takes us to, I will always be there for you, because true friends always stick together and never leave each other. No matter what obstacles life may throw at us, we will always overcome it all, because two is always better than one. And you plus me equals an unbeatable and unstoppable team. I cherish you so much, my dearest friend. 2. Hello my sweetest friend, I want you to know that I'm blessed to have a great friend like you. Your friendship is invaluable to place a price tag on, and it's more precious than the finest gold and silver in the entire universe. You've touched my heart in so many ways that I could never have thought of your care and love and I will always treasure our friendship with every breath in me. I love you, my beautiful friend. 3. You happened to be someone who I don't expect I will get along so well and be happy with. You were a familiar stranger as you were someone whom I don't know before. But guess what? You turned out to be the best thing and one of the most beautiful things that ever happened to me in life. I love you, my darling friend. 4. A true friend always understands even when the other one is not saying or doing anything, and you have always understood me even in the moment when I am not saying anything as the best and true friend which you are. Thank goodness that our path crossed and I met an understanding friend like you. I cherish every moment with you, my lovely friend and I love you so much. 5. There will be times when we will no longer see each other as often as we used to; there will be moment of ups and downs in our journey on the path of friendship; there will be time when the stormy weather of life will seem to break the bond between us and there will be moment when we would want to call it quit between us. I want you to know that I will not give up on us, at least not without a fight, because you're the best thing that ever happened to me in life and I won't trade you for the finest pearl in the world. Come rain or the sunshine, you will always be my best friend forever. I love you, bestie. 6. I might not be able to know everything about you, my dearest. Because each and every day is another avenue for me to know you a bit more than before; to get to be closer to you and cherish you so much more than ever before. And I want you to know that one of the reasons why I'm with you is to know you much better. I adore you, my beautiful friend. 7. My Dear lovely friend, today like every other day, I pray that our friendship will always blossom and knows no end. It will always stay fresh like the early morning river. Each and every day will be another chance to cherish and love each other so much more than ever before and we will always be together till the end of time. I love you beyond the stars, my adorable friend. 8. Just as much as an empty brain needs wisdom and knowledge, so also I need a great friend like you. Just as much as the body needs blood and water, so also I need a friend like you. 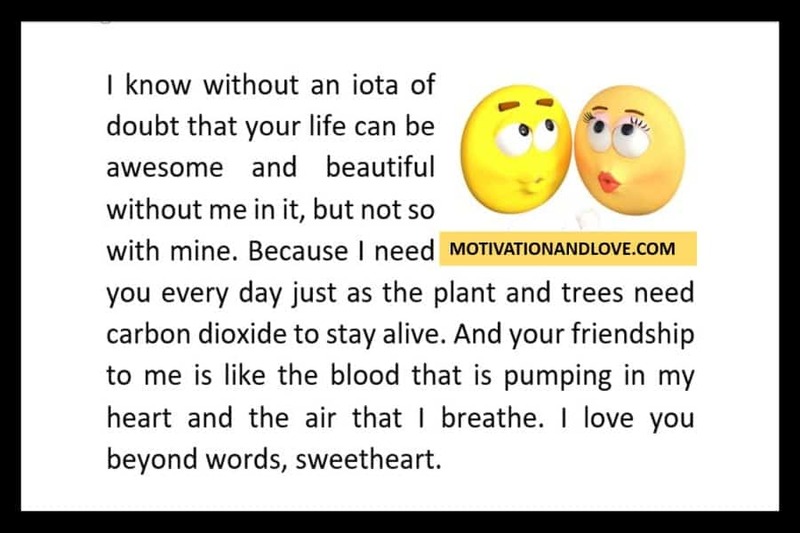 Just as much as the plant needs carbon dioxide to survive, so also I need a loving and caring friend like you Because your friendship keeps me going as it's the blood running through my veins and pumping in my heart. I love you always, my sweet friend. 9. I'm grateful to God for making our way crossed and brought you to me. We might not be together every day, but I am sure that you will always be there for me whenever I need you. Because your friendship is like the sunrise which I can't always have throughout my day, but I'm certain that you will always be there each time I wake up to the break of a new dawn. I love you more than love itself, my best friend. 10. If our friendship was to be a big beautiful building; I would be the ground, to protect you from every creepy thing and I would be the roof, to be a shade over you during the rainy day; I would be the wall to shield you from the scourging dart of failures; I would be the door, to close every disappointment behind you and I would be the window, so that you can always see clearly every opportunity within your reach. I love you to the moon and back, sweetheart. Some of the friendship paragraphs on this page have been made into best friends paragraphs with emojis. I hope you enjoy them. Best friend paragraphs for Her or Him: a collection cute paragraphs to send to your best friend female or male. 11. With a beautiful and an amazing person like you in my life, there are no more sad songs, because all I can hear now is beautiful love songs. You came into my world and add beauty to it. And with you, life is full of adventure and beautiful moment. I love you so much more than you could ever imagine, my darling friend. 12. Just as true friendship is not measured by how far we've been together but rather how well it has been between us. So also real bonding is not measured by the time we've spent together in each other company but rather the solace and solitude that comes with being with you, my awesome friend. I love you more than you know. 13. Allow me to use a few hours out of the 24 lovely hours in a day to express how grateful I am to have someone as special as you are, my friend. I just want to use a few minutes out of the 1,440 awesome minutes of each day to appreciate you for your concern and support you have always given me. I want to use a few seconds of the 86,400 precious seconds that come with each day. I love you dearly, my lovely friend. 14. I'm thankful to God for making our path crossed, but most especially for giving me the gift of not just meeting and knowing a special friend like you, but also having a beautiful and amazing friend like you are in my life. I will always cherish and love you till the end of time, my best friend. 15. Certain things happen in a certain way at a certain time and place for a certain reason. And sometimes, God brings certain people into our lives for a purpose, but whatever reasons He had in mind for making our path crossed and bringing us together, I don't really care, because I'm honoured and grateful that He did. I love you always, my dearest friend. 16. Even though we don't see each other every day, I will never stop cherishing our friendship. Even if we don't hear from each other every time, I will never stop reminiscing about you and the beautiful moment we've had together. And even though the sun stops shinning and the cloud doesn't pour down rain on the earth, I will never stop being your sweet friend. I love you beyond the stars, my sweetest friend. 17. I am the luckiest man in the entire universe because I was given an opportunity not just to meet but also have someone as special, beautiful and amazing as you are as my best friend. I promise to always cherish, respect, honour and love you so much with every breath in me till the end of time because a friend like you is very rare. You know that I love you right? Well, I do. 18. I know without an iota of doubt that your life can be awesome and beautiful without me in it, but not so with mine. Because I need you every day just as the plant and trees need carbon dioxide to stay alive. And your friendship to me is like the blood that is pumping in my heart and the air that I breathe. I love you beyond words, sweetheart. 19. I believe that people always meet for a particular reason at a particular time in a particular place, and there is no such thing as a coincidence to me because such word doesn't exist in my dictionary. I don't have any idea why we met but whatever the reason was, I'm really happy to have someone as special as you are in my life. I love you to the moon and back, my dearest friend. 20. If we had to walk one thousand steps to be together again, I would walk nine hundred and ninety-nine steps so you could only take a step. If we had to drive ten miles across the city just to see each other, I would drive nine miles so you could drive for just a mile. I feel honoured to be with an awesome friend like you and I will always cherish our friendship. I love you so much more than you could ever imagine. If you've got a best friend, these long paragraphs about best friends are all you need to express their worth to them. Post on Facebook or share with them to know how special their friendship is to you. 21. Through thick and thin, you've always been there for me; you've always got my back and I'm glad to call you my best friend forever. You're the cutest thing ever and I want you to know that I'm blessed to have someone as special as you are in my life. Thanks for being real. I love you beyond the stars, my good friend. 22. A friend like you is rare to find and that's why I'm grateful that you found me. And whether in good, bad or ugly moments, you've always been with me all the way. All I can say is, thanks for everything; everything and anything you can imagine. I cherish you forever, my sweetest friend. 23. I will always cherish every moment with you and no matter what life throws at us, it will only make our bond much stronger than ever before. I'm glad to have a wonderful friend like you, and you're amazing just the way you are. I love you so much, my beautiful friend. 24. I hope that each and every day will bring us more closely than ever before and may every day bring us so many reasons to smile, to be happy, to celebrate and be grateful. You're the best amongst the rest and I will always treasure our friendship forever. I love you to the moon and back. 25. Words will never be enough to express how blessed I am to have a caring and loving friend like you in my life. I bless the day our path crossed and I will always be grateful every day for the gift of a lovely friend like you in my life. I love you more than you know. 26. You're like a treasure to me and I will always and forever cherish every moment with you. Every day, I feel honoured to be cared for and loved by an amazing friend like you. You're unique in your own way and I'm glad to call you mine forever. Thanks for everything and most importantly, thanks for being real. I love you beyond words. 27. No amount of precious stones in the universe can bring me as much joy, love, peace and happiness as having a wonderful friend like you in my life. You're my precious precious friend and I will never trade you nor your friendship for any finest jewel in the world. I love you dearly, my best friend. 28. Everything feels perfect in my world whenever I'm with you. With you, my life is full of gratitude and joy unspeakable. You're my everyday inspiration and motivation, and I'm blessed to have a friend like you in my life. I love you forever, my dearest friend. 29. You're indeed my heaven sent because your presence always brings me happiness, peace and joy that can only come from heaven. And today like every other day, I bless God for bringing you into my life and I wish you all the joys and happiness each and every day has got to offer. I love you tenderly, my sweetest friend. 30. You always change my bad mood to an amazing one every time we're together. You care for me like no one else and nobody does it better like you, my lovely friend. Thanks for bringing me so much happiness every day. You know I love you right? Well, I do. Always have and always will. Since you've got a friend you can call the best, these Cute long messages are specially written for the best friend of yours; Friendship long messages and best friends long messages you can trust. 31. Whenever I'm down, you're always there to pick up. With you, when life gives me hundred reasons to stay down, I always give it hundred and one reasons to get back on my feet. Thanks for being my strength, my courage, my inspection and my friend. I love you forever, my good friend. 32. Dearly beloved, I want to let you know that I will never stop loving you. With you, I always have a reason to smile; I always have a reason to be grateful, and with you, I always have a reason to be happy every single day. Thanks for not leaving me to my ruins and thanks for everything else you can think of. I love you so much, my dearest friend. 33. You've taught me how to stay positive and calm even in the face of the uncertainties of life. With you, every day comes with new adventures, new experiences and new ideas. You're simply the cutest thing that ever happened to me and I just want to take a moment to say, thanks for everything. I love you beyond words, my beautiful friend. 34. I'm so proud of who I am today, and who I am today is all thanks to someone who's amazing, inspiring, caring, supporting, loving and understanding, and that someone is you. Yes, you! Thanks for making me into a better person each and every day. Thanks for loving me just the way I am and thanks for being real. I love you beyond the stars. 35. You've seen me at my worst moment, yet you stood by me. You exceeded my expectations and I'm blessed to have you. And words will always fail me to express how grateful I am to have such a wonderful and amazing friend like you in my life. I love you more than love itself. 36. Wherever I am, there you will always be, because you're always on my mind and in my heart. And not a day goes by that I don't think about you or your friendship. Your friendship means everything to me and I will do everything to nourish it and to keep it growing every single day, for the rest of my life. I cherish you forever, my sweetest friend. 37. Everything feels beautiful and perfect as soon as we're together, and a day with you is a day well spent. You're the cutest thing ever and I'm glad to have you as a friend, just as much as I bless the day our path crossed. I love you tenderly, my best friend. 38. I need you every single day just as much as a plant needs carbon dioxide to survive. Thanks for everything you can imagine and I want you to know that your friendship means a lot to me and I won't do anything to jeopardize it. I love you to the moon and back. 39. Having a best friend like you in my life is the best thing that ever happened to me and I will always and forever cherish every moment with you. You're indeed the best amongst the rest and I'm blessed to call you mine forever. I love you dearly, my good friend. 40. Ever since you came into my life, everything around me has never been the same thing, because your presence brought boundless happiness, unspeakable joy and unconditional love. With you, I'm confident that tomorrow will be better than today. I love you forever, my best friend. Sweet and cute paragraphs you can write and send your best friend (or best friend forever). 41. Cheers to many more years of prosperity, happiness, goodness, and most especially, to many more years of friendship and cheers to the best friend ever - You. You know I love you right? Well, I do. Always have and always will. 42. You're the best and cutest thing I've ever seen and I'm honoured to be cared for and loved by someone as amazing and special as you are. I will always love all of you just the way you are, as much as you always cherish and love me the way I am. I love you beyond the stars. 43. Through the uncertainties of life, you've always been there for me and all I can say is, thanks for everything and anything else you can imagine. And today like every other day, I wish you all that you wish yourself and may our friendship knows no end. I love you more than you know. 44. You know I'm not perfect, yet you love all of me like I've never been loved before. You said you will always be there for me and you've never gone back on your word. Thanks for making me feel special each and every day, and I will always cherish every moment with you. I love you dearly, my best friend. 45. Dearly beloved, I just want to take a moment to say thank you for being patient with me all the time, thanks for your understanding, your concern and for making me a better person than ever before. In short, thanks for everything and anything else you can think of. I love you beyond words. 46. You're indeed one of the best and cutest thing that ever happened to me in life and I'll forever be grateful for having a wonderful and caring friend like you in my world. I love you with all my heart and I will never stop loving you. I love you more than love itself. 47. You're more than what I expected in a friend. You're amazing just the way you are and I hope to always cherish and love you more than you can imagine. With you, every day is an avenue for new experiences, new adventures and new ideas. I love you so much, my best friend. 48. I'm honoured to be cared and loved by someone as amazing as you are, and I'm blessed to call you mine forever and I also want you to know that you're the best thing ever and your friendship is the cutest thing ever. I love you beyond the stars. 49. Dearly beloved friend, I want you to know that I will never do anything to hurt you intentionally nor jeopardize our friendship because your friendship is one of the best, cutest and sweetest thing that ever happened to me in life. You mean the world to me and I will always cherish every moment with you. I love you tenderly, my dearest friend. 50. You're not just a friend, you're my confidant, my everyday happiness, my inspiration and my motivation, but most importantly, you're my best friend forever and I will always and forever cherish and love you. I love you more than you know. When you finally decide to send him or her some I love you paragraphs or I love you long messages, these I love you best friend paragraphs are the sweetest you can ever find online. 51. A day without you is unimaginable because you're a bigger part of my life now and everything about me revolves around you, my good friend. Be it good or bad time, you're always there for me and I'm blessed to have such an amazing friend like you in my life. I love you beyond the stars. 52. Your friendship is priceless, irreplaceable and it's the cutest thing ever, just as much as you're irreplaceable and no one fits perfectly in my life like you do. You're more than what I expected and you happen to be the best thing that ever happened to me. I love you to the moon and back. 53. You've touched not just my heart in a special way with how you cherish and love me, but also my life and my world. I'm blessed to have an amazing friend like you and I'm glad to call you mine forever. You know I love you right? Well, I do. 54. Our friendship is more precious than any finest stone in the universe and I will never stop cherishing every moment with you, just as much as I will always treasure our friendship every single day and for as long as there's breath in me. I love you forever, my best friend. 55. You always support my dreams, goals and aspirations, even when you don't understand it all, you still go out of your way to motivate and inspire me to be better each and every day. Thanks for your understanding and patient, and I love you more than you can imagine. 56. You're my everyday inspiration, confidant, motivation and happiness. With you, life is full of expectancies, adventures and beautiful things. You're my best friend and you will always and forever be. I love you to the moon and back. 57. No matter the distance between us, the sweet and beautiful memories we've had is enough to never stop reminiscing about you till we see each other again. You've given so many awesome memories and I look forward to many more great and amazing moments. I love you tenderly, my sweetest friend. 58. You're my everything and you mean something to me. I'm blessed to have you, I'm honoured to be cared and loved by you, and I want you to know that you've always meant something and I will always cherish every moment with you. I love you beyond words, my lovely friend. 59. I will never stop being grateful to God for bringing such a wonderful, caring and loving friend like you into my life. Words will fail me to express how grateful I am for having a great friend like you. You know I love you right? Well, I do. I love you, my best friend. 60. Thank you for always being there for me. Thank you for loving me just the way I am. Thank you for not leaving me to my ruins. Thank you for being the best and cutest thing ever. Thank you for making me into a person whom I'm proud of today, and thank you for being real. I love you more than love itself. 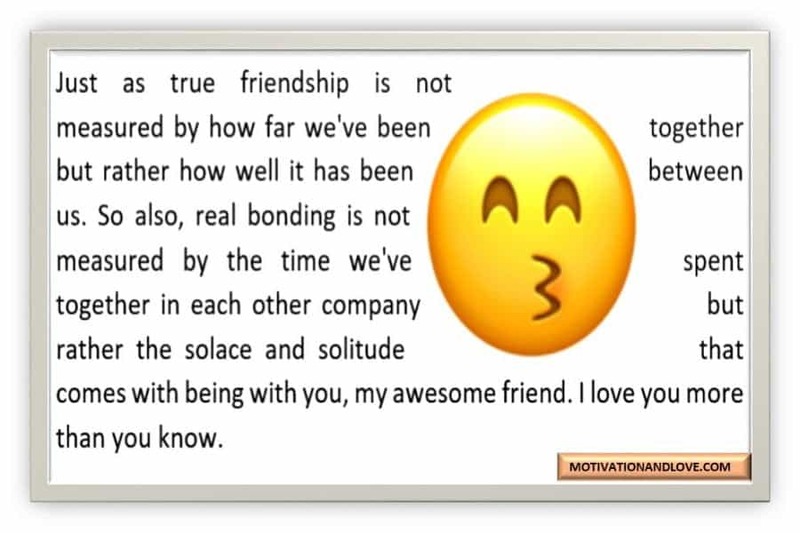 Now that you have a friend that you can tell people, "this is my best friend", you should be willing to send as many of these my best friend paragraphs as possible to him or her. 61. Because of you, my world is perfect and beautiful. Because of you, my life is full of expectancies, adventures and wonderful things, and because of you, my heart is filled with gratitude every single day. I love you so much, my dearest friend. 62. Through thick and thin, you've always been there for me and no matter what happens, you will always and forever be my best friend. You're my everything and my world, and thanks for everything and I cherish you forever. I love you dearly, my best friend. 63. I will always be here for you because you've always been there for me. Even when it wasn't convenient for you, you still came through for me times without number. Thanks for not leaving me to my ruins. You know I love you right? Well, I do. 64. You're my everyday inspiration, happiness and joy, and I'm happy you found me, and not only that, you also turned out to be the best thing that ever happened to me in life. I will today and always cherish our friendship. I love you to the moon and back. 65. You've always seen the best in me even when others couldn't. In my worst moment, you still stick around with me. Even when I pushed you away, you still cared and loved me more than ever before. Thanks for not giving up on me and leaving me to my ruins. I love you more than you know. 66. There's someone who cares about me more than I care about myself. There's someone who always sees the best in me each and every day. There's someone who encourages me to be better every single day. There's someone who loves me like I've never been loved before, and that someone is you, my best friend. I love you forever. 67. You were there for me when no one else was here for me. You helped me to see life from a better perspective. You taught me how to live again when I thought all hope was lost. Thanks for not giving up on me. Thanks for your concern and understanding, and thanks for being real. I love you beyond the stars. 68. You made me realize that there is more to life than just living. You made me believe in myself again every time I found myself at the edge of tapping out on life, my dreams and goals. And today like every other day, I bless God for bringing you into my heart, my life and my world. I love you so much, my best friend. 69. Thank you for loving me just the way I am. Thank you for your concern, understanding and support. Thank you for being real with me every time. Thank you for being the best thing that ever happened to me, and thanks to you for being my everyday inspiration and motivation. I love you beyond words. 70. You're beautifully and wonderfully made just for me. You're beautiful, you're smart and you're intelligent. But most of all, you're my best friend forever and I will always cherish every moment with you. I love you to the moon and back. Cute Paragraphs for Best Friends? I know you need some cute paragraphs for best of friends and I have helped with this collection of cute best friends paragraphs to your heart's delight. 71. You're the cutest person I have ever seen and I'm honoured to be cared and loved by someone as amazing as you are, just as much as I'm blessed to have you in my life. You're indeed the best thing that ever happened to me and I love you more than you can imagine. 72. Having someone as special and beautiful as you are, makes me the happiest and luckiest guy in the universe. With you, every day comes with a new beginning, new vibes, new ideas and beautiful things. With you, my world is a better place to live in. I love you to the moon and back. 73. There's no dull moment with an amazing and awesome friend like you, and lonely and boring would my life be without you in it. Whenever I'm around you, nothing else matters, because I'm with the person that really matters - You. I love you so much, my best friend. 74. I feel blessed every day to have a wonderful and caring friend like you in my life and I will always and forever cherish and treasure our friendship so much more than words can describe. You know I love you right? Well, I do. Always have and always will. 75. There's nothing I will love to trade for your friendship, not even the finest pearl in the universe because your friendship is as wonderful, amazing, precious and beautiful as you are. And you're always amazing just the way you are. I love you more than love itself. 76. No matter how rough the road might be, with you, I can walk many miles and never get tired or exhausted. No matter the unpleasant circumstances and uncertainties of life, with you, there is always light at the end of the tunnel. I love you so much, my sweetest friend. 77. You always understand me when no one else does and you always love me like I've never been loved before. You're one of a kind and your friendship is so precious that I can't trade it for anything in the world, not even the finest pearl and purest of gold. I love you beyond words. 78. I'm blessed to have someone as special as you are. You were and you will always be that one person I will always confide in. You're my strength and my courage, my inspiration and my motivation. I love you dearly, my beautiful friend. 79. I'm so happy that you found me, because my life without you is incomplete, just as much as my world without you is unimaginable. The bond between us is verbally indescribable, just as the happiness and joy that comes with you and your friendship are priceless and boundless. I love you more than you know. 80. I will never be able to thank you enough for everything and anything you can imagine your friendship has brought me thus far. You're more than what I expected and I'm blessed to have someone as unique as you are in my life. I love you so much, my best friend. To the one that deserves being called a bff (best friend forever), these paragraphs for bff are so cute to be sent. Tbh, you are my best friend and I owe the world that announcement right away. Thanks for being my best friend. 81. With you, every single day is an avenue to visit new places, try new things and have new experiences. You're my very special friend, you're kind and amazing, you're wonderful just the way you are and I will always cherish every moment with you. I love you, my best friend forever. 82. There will never be a price to place on your friendship because it's priceless and every single moment with you is beautiful and amazing just the way you are. I'm honoured to be cared for and loved by you and I'm glad to call you my best friend forever. You're sweet, BFF. 83. The happiness that comes with being with you is boundless, the joy is always unspeakable and I know without an iota of doubt that your love will be an unending one. In my weakness, when I'm with you, I'm strong. I love you so much, my best friend forever. 84. We will always be together, and no matter what life throws at us, our friendship bond will only get stronger than ever before. You're such an amazing friend and I'm blessed to have you in my life. I love you forever, bestie. 85. Your friendship is one of the best gifts anyone can ever wish for. You're caring, you're loving, you're patient and understanding and I'm honoured to be loved by you. Thanks for loving me just the way I am, but most importantly, thanks for not leaving me to my ruins. I love you so much, my best friend forever. 86. I will never ever take you or your friendship for granted because you're the best thing that ever happened to me and I will always cherish every moment with you. You're my everything and my world. I love you forever, my dearest friend. 87. You make me feel at home every time I'm with you; you make me a better woman every moment we're together and you make me see life from a better perspective. I love you so much, my best friend forever. 88. I'm a better person than ever before and it's all because of you. You make me want to get more out of life with the way you care and love all of me. I'm blessed to have you in my life and I wish you all the joy and happiness each day has got to offer. I love you beyond the stars. 89. I'm glad to have an amazing, a loving and special friend like you in my life, and I bless God for making our path crossed. You know I love you right? Well, I do. Always have and always will. I love you so much, my best friend forever. 90. Come rain or sunshine, you will always be my courage and my strength. Your friendship has taught me great things in life and I'm blessed to have you in my life and my world. With you, the future will always be brighter. I love you to the moon and back. Cute paragraphs to send to your Bff. 91. You've always been there for me - in good times and at bad times, through the ups and downs, and uncertainties of life. You encourage me to be a better person every single day and I will always cherish you for the rest of my life. I love you, my best friend forever. 92. With you beside me, no dream is too big to dream and neither is there any aspiration nor goal too high for me not to attain. You inspire and motivate me to do better and be better than ever before. Your words of encouragement always keep me in check and keep me going. You're sweet, BFF. 93. Thank you for being the best thing that ever happened to me. Thank you for being the cutest thing ever. Thank you for being my best friend and I'm blessed to call you my best friend forever because there's no end to the bond between us. I love you so much, my best friend forever. 94. I must indeed be the luckiest girl in the universe to have a special, loving, amazing and understanding friend like you. To me, you're the best and cutest thing ever. If I had to choose all over again, I will choose to be with you. I love you more than love itself. 95. To the one who cares for me like no other; to the one who loves me like I've never been loved before; to the one who holds a special place in my heart, life and world. And that special someone is you, my sweetest friend. I love you, my best friend forever. 96. Thanks for being my courage in times of fear and doubt. Thanks for being my strength whenever I'm weighed down with the uncertainties of life. Thanks for being real and thanks for always being there for me. I love you beyond words. 97. You're my special friend and you treat me in a special way every time I'm with you. Joy, love and Happiness are always within reach whenever you're around. I'm glad to be with you and I'm blessed to have a wonderful friend like you. I love you so much, my best friend forever. 98. No matter what life throws at us; no matter the unpleasant circumstances that come our way, and no matter the uncertainties of life, our friendship bond will always be stronger than ever before and I will always cherish every moment with you. I love you more than love itself. 99. There's no word to express how grateful I am to have someone as special and caring as you are. You're more than words can describe, and there will never be a perfect word to convey how unique you are. Thanks for being real, thanks for everything you can imagine. I love you to the moon and back. 100. I'm honoured to be loved by someone as loving and understanding as you are, and I'm glad that you found me, and if I were given a chance to choose my friend, I would always choose to have an amazing and special friend like you all over again and again. I love you so much, my best friend forever. Sometimes, you want to your best friend to wake up to some sweet and cute paragraphs. If it's the case today, read these cute paragraphs to send to the special frind of yours.